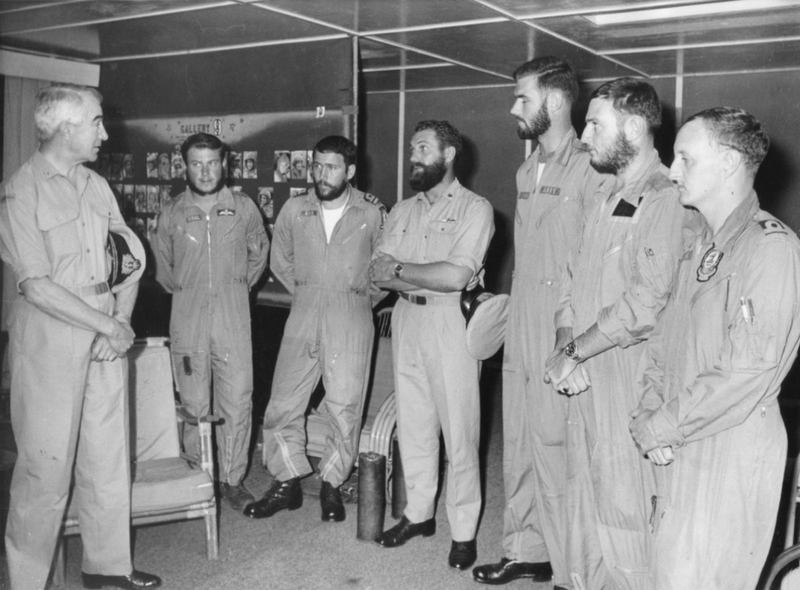 Early in 1966 the Australian Government decided to increase the Royal Australian Air Force's (RAAF) active commitment in Vietnam. Later that year on 12 June, No. 9 Squadron RAAF arrived in Vung Tau equipped with eight Iroquois UH-1B helicopters. The squadron was posted to Vietnam with the specific task of operating in direct support of the 1st Australian Task Force which was based at Nui Dat, a rubber plantation situated in the centre of Phuoc Tuy Province, about eighteen miles due north of the Vung Tau air base. In the later part of 1967, the RAAF began to replace 9 Squadron's UH-1B aircraft with the larger and more powerful UH-1H variant. At the same time the squadron's strength was to be doubled from eight to sixteen helicopters. 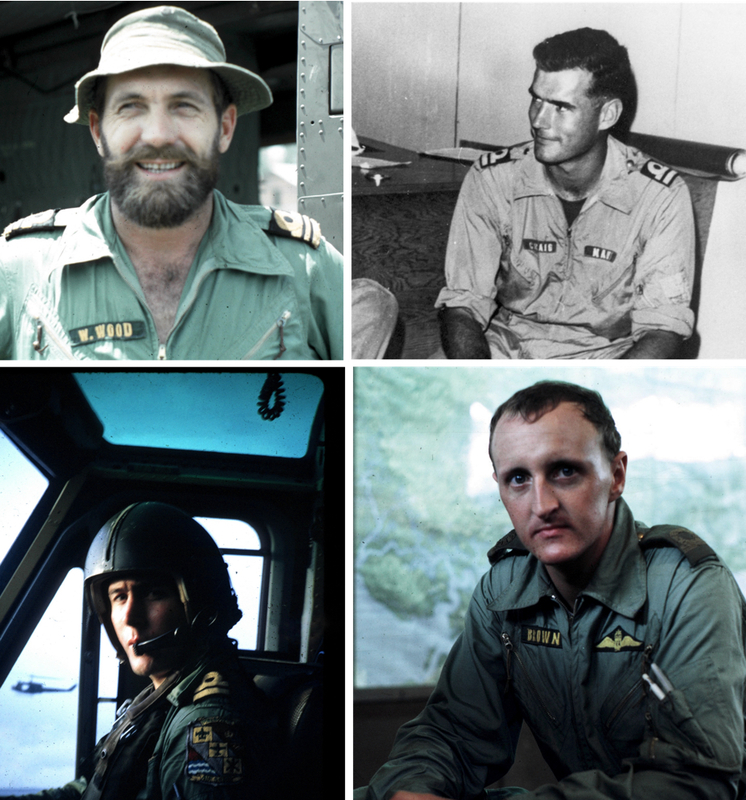 Due to the RAAF's other commitments in Vietnam, Malaysia and within Australia, this decision resulted in a severe shortage of airforce pilots and the Royal Australian Navy (RAN) was asked to fill the gap temporarily. Consequently eight RAN Fleet Air Arm pilots were assigned for duties with 9 Squadron in 1968. 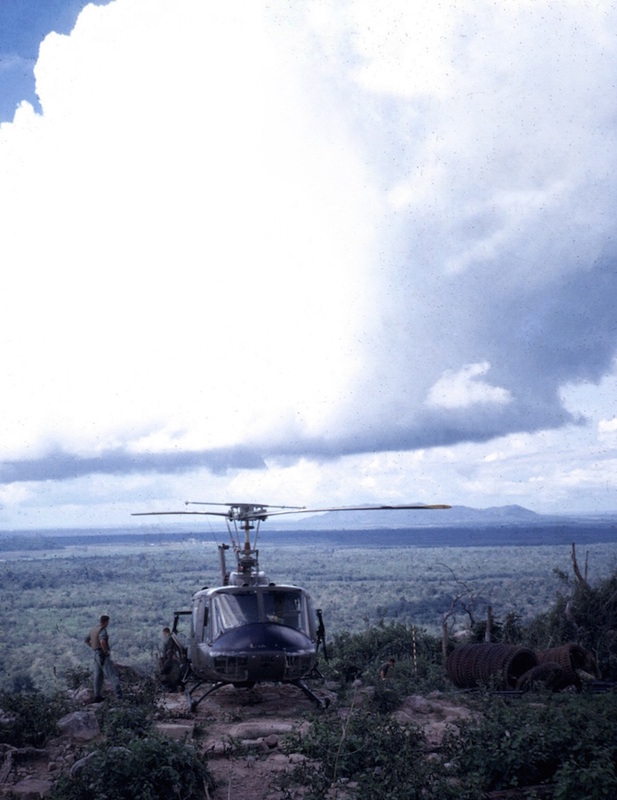 An Iroquois of 9 Squadron takes a break between missions on the Nui Dinh Hills. Lieutenant AA Hill, the first of the RAN pilots, joined 9 Squadron in February. He was followed a month later by Sub Lieutenants GES Vidal and MJ Ward. The remaining pilots joined in May, with Lieutenant Commander RA Waddell-Wood being appointed officer-in-charge of the detachment. In addition to the RAN detachment, 13 pilots from the Royal New Zealand Air Force also flew with 9 Squadron. It was particularly appropriate that 9 Squadron should have acquired an RAN detachment, as the Squadron itself began as No. 101 (Fleet Cooperation) Flight in July 1925 which was formed to provide aircraft for naval reconnaissance and survey. Throughout its history 9 Squadron enjoyed a close relationship with the RAN, particularly during World War II when it operated a number of amphibian aircraft from RAN ships until it was disbanded in December 1944. Left: Lieutenant Commander Rolley Waddell-Wood, RAN. Right: Lieutenant Tony Hill, RAN. With nearly all of the 1st Australian Task Force operations being air-mobile in concept, the first major role of 9 Squadron was to provide troop lift capacity for the Army. The Squadron's second major task was resupplying troops in the field with food, ammunition, clean clothing and stores. An equally important role was aerial fire support, and to give 9 Squadron a greater capacity for direct support of Army ground operations, a specially modified UH-1H was introduced early in 1969. The 'Bushranger' helicopter was a UH-1H equipped with a modified XM-21 armament sub-system of two rocket pods each holding seven 2.75 rockets; two miniguns, each capable of firing 4,800 rounds per minute; and two M60 machine guns, handled by door-gunners. This armament sub-system could be removed in three hours to convert the Bushranger gunship to a troop carrying utility (slick) if additional troop lift capacity was required for operation. The Bushrangers, operating as a light fire team of two helicopters, escorted slicks in combat assaults, provided suppressive fire on enemy bunkers and protected MEDEVAC aircraft. They also supported slicks that inserted and extracted Army Special Air Service (SAS) patrols in enemy occupied jungle areas. The extraction of SAS patrols, especially 'hot extractions' when the patrols were in contact with the enemy, was a particularly dangerous operation. 9 Squadron aircraft were regularly required to land and take off in small clearings, or hover over jungle within range of hostile fire while taking on board the SAS troopers. Left: RAAF UH-1H on Kangaroo Pad. Right: Troop lift. On 28 July 1968 Lieutenant Commander Waddell-Wood and his RAAF crew were tasked with one such mission that called for a 'hot' extraction of an SAS patrol in a jungle-clad area of Phuoc Tuy Province. Due to the presence of thick vegetation. the crew had no choice but to adopt a winch extraction even though the Viet Cong were firing automatic weapons at the Iroquois from a range of just 30 metres. Ignoring this fire, the Navy pilot held his helicopter in the hover until all the troops had been winched aboard and then returned them to Nui Dat without further incident. A high degree of flying skill was also called for in missions flown in support of troops operating in the Long Hai hills, five miles north west of Vung Tau, where the Viet Cong were entrenched in a complex of caves and bunkers. Here changeable air currents, few and small landing pads in the narrow valleys, and the ever present danger of hostile small arms fire combined to place the pilots in constant jeopardy. Sub Lieutenant Geoff Vidal experienced many of these hazards during an operation in mid-1968. He was tasked to evacuate two wounded Australian soldiers from the middle of an enemy bunker complex. When he reached the scene of the contact the naval aviator found that he had to make a hazardous descent down to the landing zone as the trees in the area were 40 metres high. He gradually worked his way down to the ground and picked up one of the wounded troops (there was only room in the helicopter for one stretcher case), all the while being subjected to heavy ground fire. He then made the equally hazardous ascent under the cover of gunship attacks, which suppressed some of the enemy's fire, and delivered the soldier to a safe clearing where he was transferred to another helicopter and taken to hospital. Sub Lieutenant Vidal then returned to the contact site and repeated the whole hazardous process to extract the second wounded soldier. 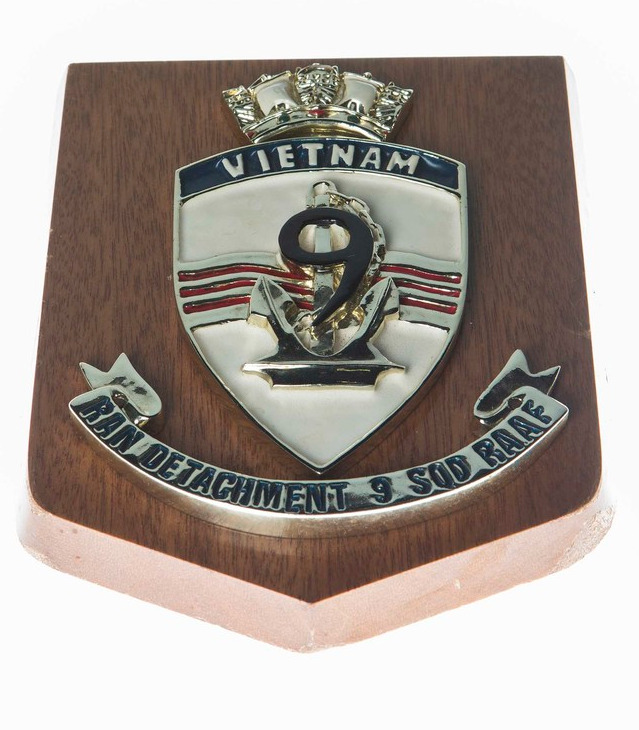 The RAN Detachment played a significant part in enabling 9 Squadron to meet its army support role in Phuoc Tuy Province during 1968 and into 1969 when the detachment returned to Australia. Most of the RAN pilots also flew missions with the RAN Helicopter Flight Vietnam attached to the 135th Assault Helicopter Company. The deployment had given the RAAF the chance it needed to increase its pilot training program to cater for an expanded helicopter squadron in Vietnam. 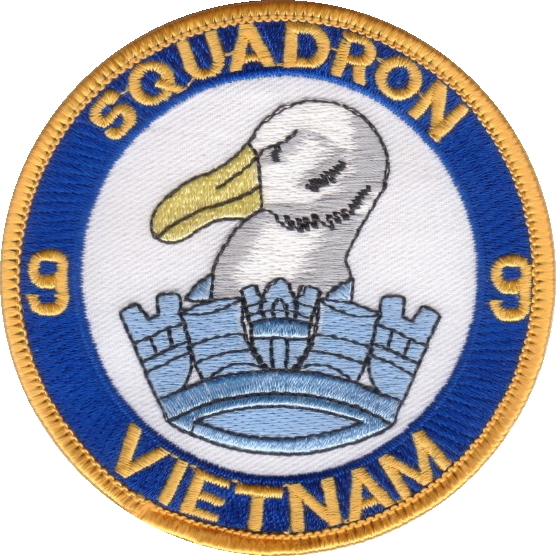 9 Squadron remained in Phuoc Tuy Province where it continued to support the 1st Australian Task Force up until the time of its withdrawal from Vietnam. The unit's last operation was flown on 19 November 1971 and its personnel and helicopters returned to Australia in the following months. The Chief of Naval Staff meets 9 Squadron pilots. 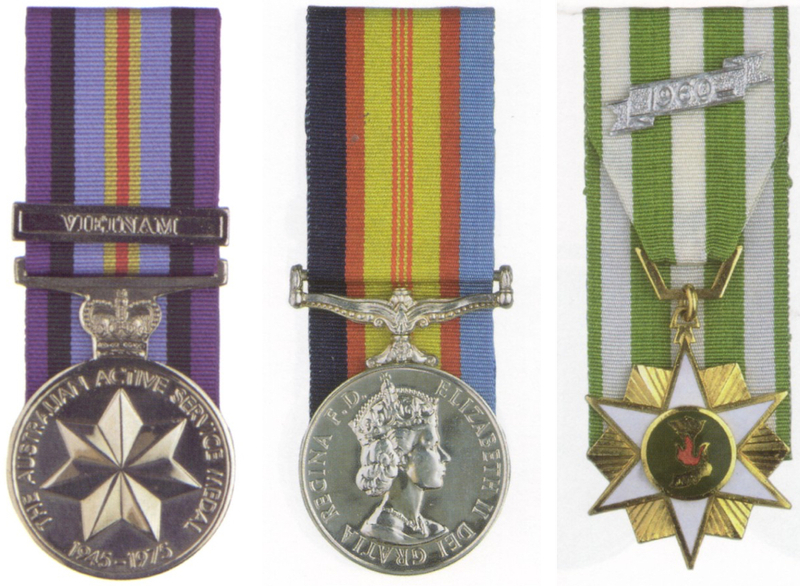 L-R: Active Service Medal Vietnam, Vietnamese Campaign Medal and the Vietnamese Campaign Star. RAN Detachment 9 Squadron Plaque. Top left: Lieutenant Commander R Waddel-Wood. 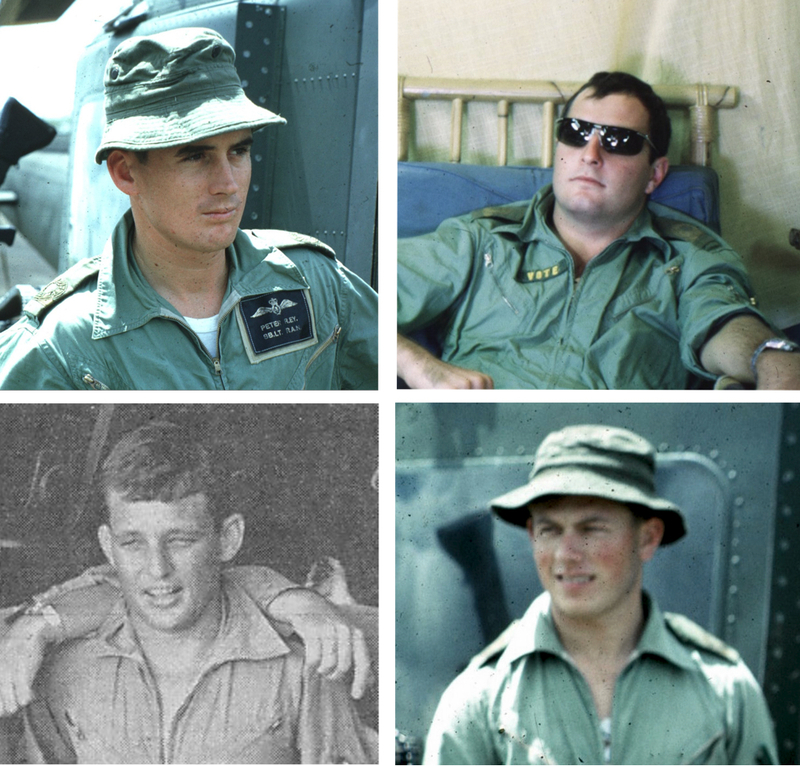 Top right: Lieutenant Andy Craig. Bottom left: Lieutenant Tony Hill. Bottom right: Sub Lieutenant John Brown. Top left: Sub Lieutenant PR Ey. Top right: Sub Lieutenant KJ Vote. Bottom left: Sub Lieutenant MJ Ward. Bottom right: Sub Lieutenant GES Vidal. 'Royal Australian Navy in Vietnam', D Fairfax, Department of Defence, Canberra. 'Get The Bloody Job Done', S Eather, Australian Government Publishing Service, Allen & Unwin, St Leonards, NSW, 1980. All colour photographic images used in the history section of this page appear with the express permission of the owner, Lieutenant Commander JR Brown, RANR (Rtd).